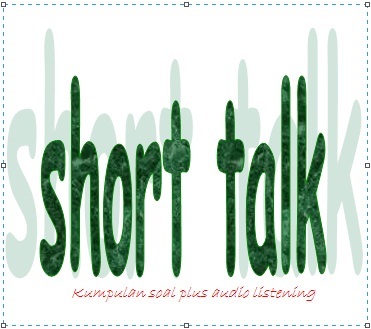 You are here : Home / Listening SMA MA / Listening SMK / short talk-monolog / Listening Test "Short Talk - Monologue"
Short monologue or short talk is one of the other parts which is tested in listening section. This part of listening test is slightly bit difficult as it leads us to listen and understand the whole idea to be able to choose the right answer. However getting exercise more in "short talk-monologue" can help us to understanding on how a short talk or short monologue is tested. The following is the material of short talk-short monologue which is commonly tested in listening section test. The topic of the short talk monologue can vary; direction, speech, recipe, instruction and advertisement. Click the icon play to hear the MP3 audio file, or if you want to download this file, the link is provide in the end of the test. 1. What is the direction about? 2. What does possibly happen after inserting the disc into the optical driver? 3. When do we start following the on-screen instruction? 4. What instruction does speaker talk about? 5. What is the first step in making that pudding? 6. What is the dessert for? 7. What does it advertise? 8. How many colours are available for the product? 9. What will we get as a bonus if we buy the product? 10. What can Anita’ cake provide for early morning meeting? 11. Which statement is true according to the advertisement? 12. What time does coffee role and donut suit for? 13. What change has been announced? 14. What is the weather condition? 15. Where does the flight go? 16. What is the speech’s purpose? 17. How many days will it last? 18. Why do they deserve extra bonuses? where is the schript of the listening mp3 above? where is the key answer? Tips of doing listening test. The exercises of English listening. 1. Do not be fooled match between what you hear the sound (audio) with which you read (booklet). Sometimes the right answer instead of saying different (but means the same). 3. Form (sound) that differ among the four answer choices, usually can be taken as a TEMPORARY ANSWER. 5. Beware the words 'NEGATIVE' as absent (not present) in the booklet, the word did not COME (not present) from an audio device, as well as with the sentence ACTIVE - PASSIVE. 6. In part B (Dialog TWO PEOPLE) are overlaid Narrator, focus on BOTH PEOPLE. The first person just giving feedback, the third person (narrator) just ask the purpose of conversation. 7. In section C (Conversation, TWO or MORE), create and anticipate questions with 5W 1H (WHAT, WHEN, WHY, WHO, WHERE, and HOW). 8. Exploration of key words from each alternative answer. For example, when writing AT A RESTAURANT, maybe you'll hear the word MENU, ORDER, FOOD, BEVERAGE, SPOON, WAITER, and so on. ada gak cara paling ampuh mningkatkat kemampuat listening bahasa inggris?? listening is the most difficult test in English. and many students fail in that audio test. How can we be success in listening test?